The Endeavour segment of the Juan de Fuca ridge is home to one of the deepest (2200 – 2400 m) collections of experiments in the NEPTUNE Observatory. This deep-sea mountain ridge is located approximately 300 km off the British Columbian coast along the spreading crustal boundary between the Juan de Fuca and Pacific tectonic plates. The Endeavour site presents an elaborate network of seafloor structures where active hydro-geothermal venting creates highly variable local temperatures throughout the system. Due to its dynamic characteristics, Endeavour offers a rare opportunity to study globally significant chemical, biological and geological processes unique to these otherworldly deep-sea environments. 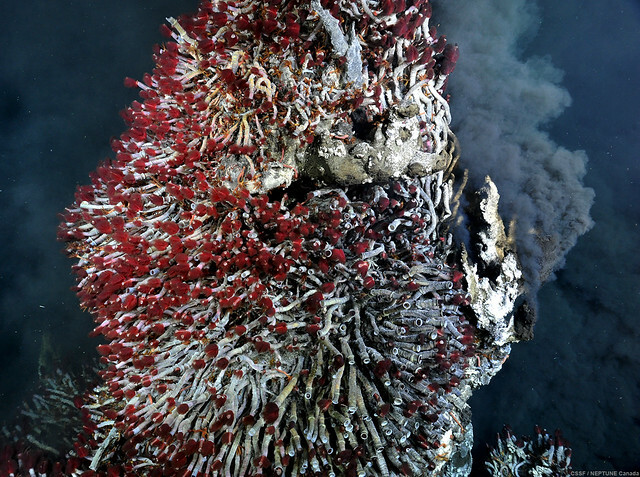 Ocean Network Canada’s Kim Juniper and Verena Tunnicliffe share their experiences studying the Endeavour hydrothermal vents in the April 19th Vancouver Sun article One of Earth’s Most Remarkable Places. This story is the fifth of a six part special series on the "Health of the Ocean." The paper’s online publication has also compiled a photo gallery of this unique ecosystem located 250 km off Vancouver Island and over two km below the ocean’s surface.